We recently talked with Daniel Stenberg about HTTP/2 and QUIC, so this news comes with little surprise looking back on that conversation with hindsight. On November 7, 2018 Dmitri of Litespeed announced that they and Facebook had successfully done the first interop ever between two HTTP/3 implementations. Mike Bihop’s follow-up presentation in the HTTPbis session on the topic can be seen here. 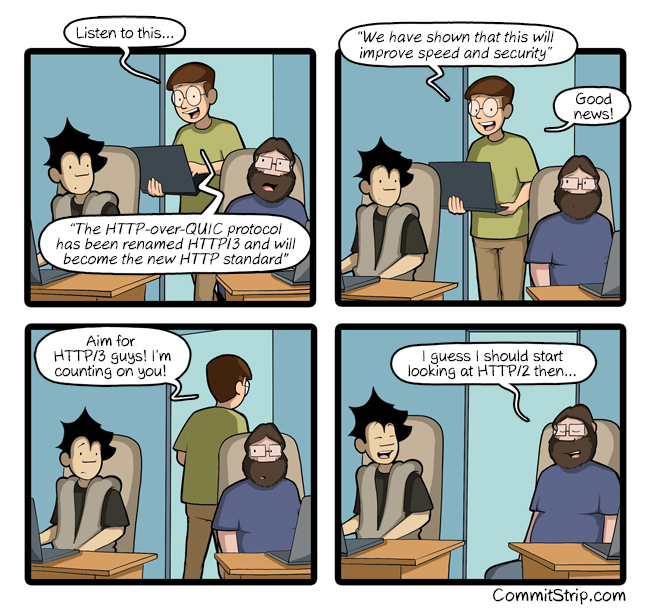 The consensus in the end of that meeting said the new name is HTTP/3! I was thinking the same thing. Let’s just skip straight to H4.